A sense of fairness is an important part of human behaviour, yet a research team involving Queen Mary, University of London (UK) found it did not evolve from our closest living relatives. The study, published in the journal Biology Letters today tested whether our great ape relatives, the chimpanzees and bonobos, have a sense of fairness like humans. The scientists, involving Professor Keith Jensen, from Queen Mary's School of Biological and Chemical Sciences, put the apes through a series of ultimatum games. One against the other, they had to choose whether to steal or leave the other's grapes. The games were set up in a variety of different ways involving equal proportions of grapes and others were split with a higher proportion given to one over the other. Professor Jensen explained: "In each scenario one ape had to choose whether to steal the grapes or leave a portion of grapes for the other. We found that consistently they would steal the food without taking into account whether their action would have an effect on their partner. "Neither the chimpanzees nor bonobos seemed to care whether food was stolen or not, or whether the outcomes were fair or not, as long as they got something. 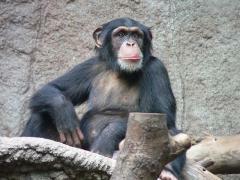 "Our findings support other studies of chimpanzees but also extend these to bonobos. Both apes have no concern for fairness or the effects that their choices may have on others; in stark contrast to the way humans behave. "We can therefore conclude that our results indicate that our sense of fairness is a derived trait and may be unique to the human race. "If fairness considerations are important for cooperative activities such as trading goods and services and sharing, the question then is, when did they evolve in our species? And if fairness is important only in humans, the question is why only in humans?" More information: 'Theft is an ultimatum game' is published in the journal Biology Letters on 15 August 2012.